The ACR1252U NFC Forum–Certified Reader runs on 13.56 MHz contactless technology. It supports ISO 14443 Type A and B, MIFARE®, and FeliCa cards, ISO 18092–compliant NFC tags, and other NFC devices. ACR1252U is capable of the three modes of NFC, namely: card reader/writer, card emulation, and peer-to-peer communication. It also has a SAM (Secure Access Module) which can be used for key diversification and mutual authentication, providing high-level security in contactless transactions. 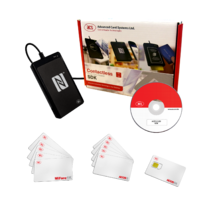 Comprehensive SDK—The ACR1252U Comprehensive USB NFC SDK is a collection of PC/SC–compliant sample codes, for device and contactless card programming for Java, MS Visual Basic 6.0, MS Visual Basic .NET 2008, MS Visual C# .NET 2008, MS Visual C++ 6.0, and MS Visual C++ .NET. The SDK is designed to help software developers create PC-linked contactless applications, like smart posters for advertising and marketing. Peer-to-Peer and Card Emulation Capability—The Smart Card and Reader Tool in this SDK includes NFC and NDEF tools to demonstrate the NFC capability of the ACR1252U. The peer-to-peer function enables the ACR1252U to communicate with other NFC-enabled devices. The card emulation function makes the NFC device capable of behaving exactly like a standard contactless card.